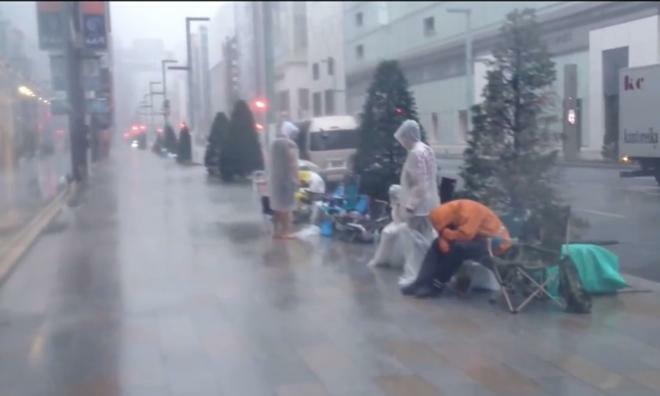 Customers camped out for this Friday's iPhone launch in Tokyo were offered refuge inside an Apple retail store just before a typhoon hit the area. Customers have been lined up for the iPhone 5s and iPhone 5c in Tokyo's Ginza since last week. But a powerful typhoon hit the city on Monday, prompting evacuations in some parts of the city. Before the storm struck, and before the Apple Store was open to the public, customers camped out for the next iPhone were invited inside for shelter, according to Kotaku. Those lined up for Apple's next iPhones were allowed to rest in the store, bring in their wet possessions, and were provided with complimentary bottled water. A YouTube user who uploaded video of the storm and refuge inside the Apple Store said they were "so moved" by how the company treated its customers. This year's iPhone launch is especially anticipated in Japan, as the country's largest carrier, NTT DoCoMo, will officially offer Apple's smartphone for the first time. That's helped to spur a price war among Japanese carriers, which has made the new iPhone 5s free with a new carrier contract subsidy for some customers. In the U.S., some customers began lining up outside of Apple's flagship Fifth Avenue store early this month, before Apple had even officially announced the iPhone 5s and iPhone 5c. Last Friday, Apple began taking preorders for the iPhone 5c, but the iPhone 5s is not available for reservation, meaning customers will have to queue up outside of an Apple or carrier store this Friday if they want to get their hands on the new handset on launch day.